Kerala has the reputation of being one of the very few unrivalled destinations in backwater tourism across the globe. Kerala’s backwaters have intrigued and allured travellers for years. Stretched across half the length of Kerala state collectively forming more than 1900 kilometres of canals, inlets lakes, rivers and lagoons, less than half of which is traversable, this majestic natural occurrence of low lying shallow water bodies are a wonder in themselves. Alleppey has always been the most prominent backwater destinations in Kerala. Apart from Alleppey; Kumarakom, Kollam Kottayam etc. are also Kerala’s prominent backwater destinations though they haven’t achieved the worldwide recognition and stature that Alleppey enjoys. Though quite cliché, Alleppey is indeed the Venice of the East is every right. Closely related to the maritime history of the state, Alleppey has always attracted and amazed people from far and wide. Often regarded as a destination of a lifetime, Alleppey holds the position of being the heart and soul of the state’s backwater tourism. The best of Alleppey is enjoyed cruising through its calm waters experiencing the sheer joy of serenity while the gentle sway of your boat will lull you into a state of absolute peace. There are different modes of experiencing this amazing feeling. Tourists can choose their means according to their budget and the kind of experience that they are seeking. 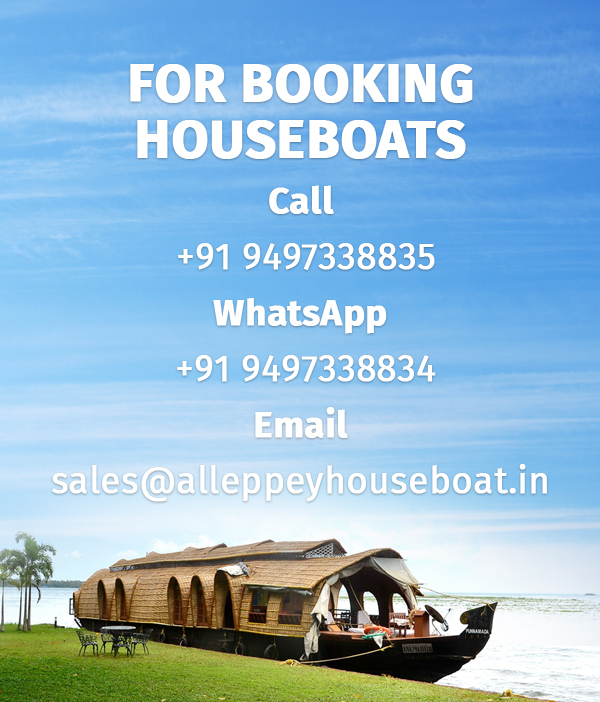 Houseboats are the most popularly preferred medium opted by tourists to explore Alleppey backwaters. Houseboats or Kettuvallam as they are called in Malayalam, the local dialect, were traditionally large cargo boats that carried rice and other spices across these lakes. The word Kettuvallam is derived from two Malayalam words Kettu meaning to tie and Vallam meaning boat indicating to the fact that these boats are made without the use of a single nail on its body but rather by tying huge jack wooden planks together. They have now been revamped into the present form by building bedrooms, bathrooms and other amenities allowing tourists to stay on and enjoy the beauty of the emerald green backwaters. Today these boats are nothing short of mobile floating resorts with every luxury you could ask for from attached bathrooms, living area and upper decks to air conditioning, glass walls and swimming pools. Depending on your budget you can choose your houseboats from Deluxe, Premium and Luxury categories. On the cruise you will get to experience the true colours of Alleppey. The palm fringed river banks, the vast stretches of paddy fields, the bustling rural life whose backbone is formed by these waterways, all of which happens at a pace different to the one you are used to in your city life. The silence and the calm will definitely relax and reenergize you for a while to come. The other popular options chosen by tourists are Shikara boats, Motor boats, Canoes and Kayaks all of which are sure to give you something different from the houseboat experience but special and unique in their own respects. Alleppey being the hub of all this action is the crown jewel on the states backwater tourism scenario. The next time you are in Kerala make it a point to visit the amazing Alleppey backwaters and don’t forget to brace yourselves for a memorable experience.